First read Zone Offense and 2-3 Zone Offense. We mostly attack zones with a general zone offense and just work that offense. Usually that is all we need to do, as long as we execute well and are patient, make the zone shift, and work the ball inside. But at times, we will run a set zone play to get someone open for a good shot, whether an inside shot or a 3-pointer. In teaching our system, we first teach our basic zone offense(s), and then add a few of these plays as the season progresses. You can screen the zone. An effective method is to swing the ball to one side and then, as the zone shifts, back-screen the weakside of the zone. Note that with any of these plays, if the play breaks down, O1 should recognize this and resume your usual zone offense. Also, an important part of any zone offense or zone play is offensive rebounding after the shot goes up. Get those second and third shots! 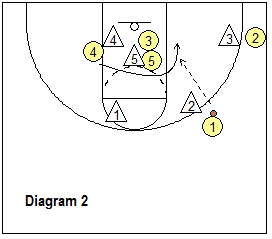 So here are some set plays that you can run against the 2-3 zone. This play is designed to attack the 2-3 zone from the back-side of the zone, using a skip pass and screening the back-side of the zone. Younger kids may have difficulty making the long skip pass and might find "Zone-1X" below a better alternative. But this is an excellent play for stronger high school teams. In diagram A, O1 passes to O2 and this will cause the zone to shift. O5 slides down into the weakside corner. 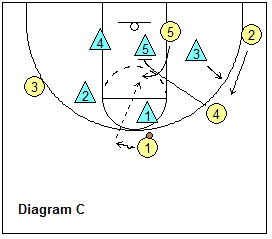 O3 backscreens the outside low zone defender so that O5 is open for the skip pass from O2. As the pass is being made, O4 cuts to the ball-side elbow (diagram B). Once the pass is made, O3 lets the outside defender slip by out to the corner and O3 now screens the middle defender in the zone. 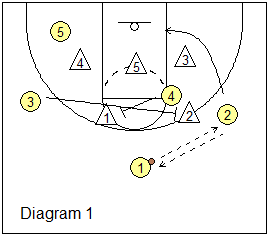 O4 cuts off O3's screen to the block for the pass and lay-up (diagram C). This play is similar to Carolina above but without the long skip pass, and younger teams would find this easier to run than Carolina. Sometimes the middle low defender will cheat up to the high post to guard O4 and the 2-3 zone now looks more like a 2-1-2. This play takes advantage of that. O1 dribbles to the right to engage the outside top defender. 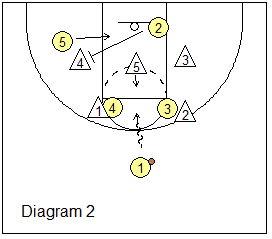 O5 sets a screen on the outside low defender while O2 slides down to the corner. O1 passes to O2. O5 allows the defender to slip outside (diagram B), and then O5 screens the middle defender in the zone. 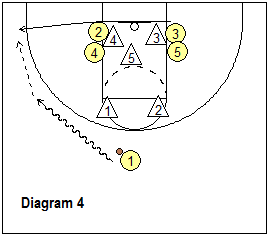 O4 cuts around O5's screen for the pass from O2 and the layup (diagram C). Some years, we have a point guard who is an excellent outside shooter and we want to get some shots for him/her. "91"is part of our "90 Series" that we run against man-to-man defense. 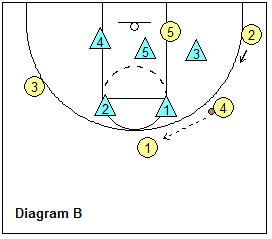 We can also run a simplified "91" against the 2-3 zone. O4 and O5 move up to the top. O1 passes to either O4 or O5 (can run it right or left). The opposite post (in this case O4), sets a back-screen for O1. O1 flares to the wing. Meanwhile the ball-side wing (O2 in this case) moves inside to clear the wing for O1, and this also keeps the X4 defender down low. The pass goes over the top to O1 on the wing, and assuming O4 makes a good screen, O1 will almost always be wide open for the outside shot. This is because of a fault in the zone itself. Versus the zone, when O4 moves up top to screen, ordinarily no defender will move up with O4 and this results in no defender being there to switch on the back-screen. This ensures O1 is wide open. After passing, O5 moves inside to rebound, as does O4. O3 rotates to the point. We run this play out of a 4-out zone offense, our "Corners" offense. O1 passes to O2, while O5 slides up and screens X2. O3 slides down to the corner. O4 cuts underneath the zone to the ballside block. O2 dribble-penetrates the seam, looking for (1) the pull-up jumper, or (2) the pass to O3 in the corner (if X3 drops inside), or (3) the pass to O4 cutting underneath the zone (if X5 comes up to defend). Sometimes our "Zone-2" offense works well against the 2-3 zone. And we can run "45" (to the right side) or "54" (to the left side) against the 2-3 zone. In "45", the pass goes to O2 in the right corner. O4 makes two screens. 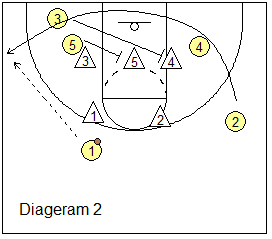 The play starts with O4 screening the outside low defender X4 so that the pass can go to O2. After the pass is made, O4 lets X4 slip the screen and as X4 moves out to the corner O4 screens the middle-defender in the zone X5. This frees O5 for a cut to the ball-side low post and the lay-up. In "54", it's all the same, except on the opposite side with the pass going into the left corner. O2 runs the baseline to the left corner for the pass. 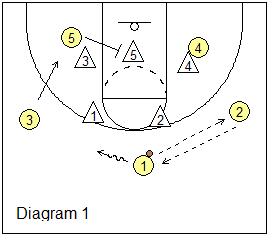 O5 sets the inside screen and O4 cuts to the ball-side low post for the pass and lay-up. 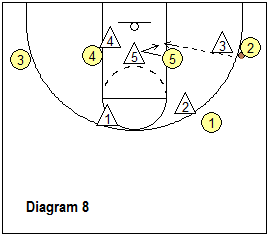 Here is another play attacking the 2-3 zone defense. Having an athletic O3 who can jump and finish inside is key. See the diagrams below. O2 sets up on the left wing, v-cuts and gets the pass from O1. O5 and O4 set up below the defense. 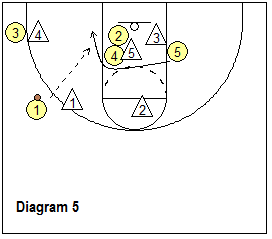 O5 back-screens the middle defender (X5), while O4 back-screens the weak-side low defender (X4). By crossing O4 and O5, we get better screening angles on both screens. O3 slides below the screens for the lob pass from O2, and possible dunk. Or if unable to dunk, O3 catches the pass, gathers and scores off the glass. There is also a man-to-man version of this play. 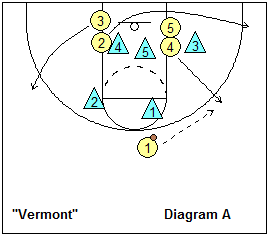 In diagram A, O1 passes to O3 and O1 moves outside to the left wing, with O3 dribbling toward the top. The initial pass to O4 curling around O2 is less likely to be open against the 2-3 zone (but could be open against a 1-2-2 zone). O4 mainly becomes a screener. After cutting, O4 locates in the left short-corner area (diagram E). O3 passes to O2. 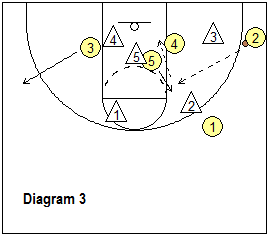 O4 pin-screens the weakside low defender X3, and O2 skip passes to O1 who has dropped down toward the left corner. This causes the low outside defender to run out to defend O1. O4 will bump and delay the X3 defender just enough to make the skip pass to the corner open. Then O4 lets the X3 defender move out to defend, and now O4 screens the middle low defender. O5 cuts underneath for the pass from O1 and the power lay-up. From Lindsay Gottlieb (University of California Women's Head Basketball Coach), this 2-3 zone play gets you either an open 3-point shot for your best shooter, or a quick basket inside. You can run it to either side. If time on the clock is not a factor, O1 passes to O2 and then O2 passes back to O1 (to get the zone to shift). If time is a factor, skip these first two passes and get right into the play. O3 drops down toward the baseline (diagram 1). O1 dribbles a little to the left and O2 cuts underneath (diagram 2) and through to the left corner-wing area for a possible pass from O1 and a shot. Meanwhile, O5 screens the middle low defender (X5), and O3 screens the opposite low defender (X4). O4 cuts under the two screens to the ballside block. 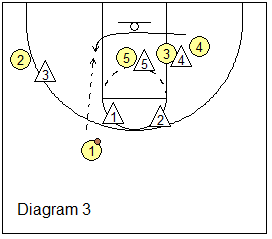 If the X3 defender moves outside to cover O2, then the quick pass from O1 to O4 is open for a lay-up (diagram 3). If X3 stays inside, O2 has the open 3-point shot, or might feed the post inside. "West" - from DVD "Lindsay Gottlieb: Attacking Zone Defenses with Continuity Offenses & Quick Hitters"
From Florida Gators head coach, Mike White, this 2-3 zone play gets you a lob pass to your big man O5. O1 passes to O2 (diagram 1). O2 holds the ball for a moment, allowing the zone to shift. On the pass to O2, O3 and O4 will "x-screen" the two top defenders. 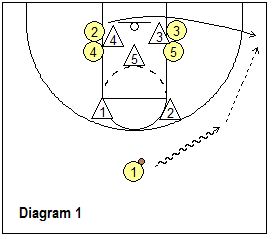 O3 sprints over and screens X2 outside, and O4 screens X1, thereby opening a lane for O1 to dribble-drive (diagram 2). O2 passes back to O1, and O2 cuts underneath and back-screens the X4 defender. O5 cuts under this back-screen to the hoop. O1 dribbles middle and this causes the middle defender X5 to come up to stop the ball. 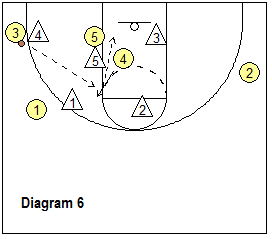 O1 lob passes to O5 for the lay-up or dunk (diagram 3). 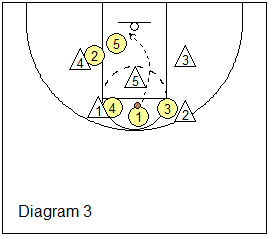 "X-Screen Lob" - from DVD "Mike White: Zone Offense Philosophy, Tactics & Sets"
There are many DVDs and videos of set plays in the Coach's Clipboard Basketball DVD-Video Store... too numerous to list here! Basketball plays that the the best coaches discuss through numerous basketball DVDs and videos are designed to demonstrate how to effectively execute set plays in special situations that can determine the outcome of a game. 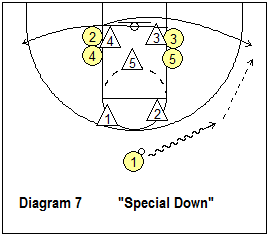 Areas covered include man and zone plays, out-of-bounds plays, endline and sideline sets designed to score under different time situations and end-of-game plays designed to score as well as get a 3-point shot. There are DVDs with special plays for motion offenses, 4-out 1-in offense, 1-4 high offense, flex offense, pick and roll offense, and others. Many more basketball DVDs at the Coach's Clipboard Basketball DVD-Video Store! In additon to many baseline and sideline out-of-bounds plays, some of the greatest basketball coaches today stress the importance of special situations that can often determine the outcomes of close games. Situations discussed include: Opening tip, free-throw situations, end of shot clock, end of half, down with under two-minutes and inbounds plays. Each play featured in this category is designed to place you and your players in the best position to win.